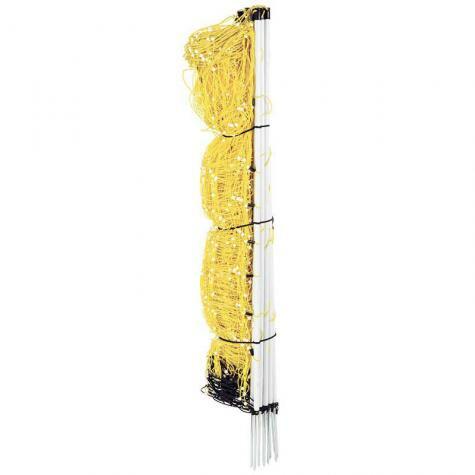 A prefabricated fence that has 9 horizontal twines (8 conductive); is 42" tall installed, and has a plastic string vertical every 6". 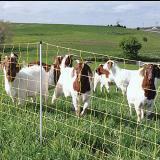 White PVC posts are built into the mesh every 13.5 ft The result, when energized properly, is a nearly impenetrable mesh to sheep, goats, coyotes and dogs. 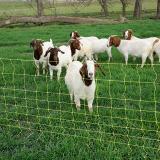 How does Goat Net compare to ElectroStop and ElectroStop Plus? Weaker posts (smaller in diameter). Posts spaced apart 13.5'. 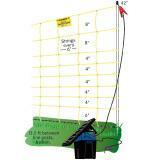 Has string verticals instead of plastic struts. So it is more prone to sagging and more likely to tangle and bunch when installing and removing. Verticals occur every 6" instead of 12". One less energized strand (9 vs 10). Electrical resistance (380 ohms/1000 ft) is 10 times higher. Not advised for fences longer than 2 to 3 rolls of netting or fences exposed to heavy weed load. Horizontal Spacings 6", 4", 4", 4", 4", 4", 8", 8"
Recommended: 11 out of 12 said they would recommend this product to a friend. This fence is awesome! Will buy from Premier 1 again. I set it up and stayed in with them for a while after powering it and made sure they both got a few zaps before I got out. It wasn't 20 seconds before my doeling jumped right over then my buckling charged through the net and got terribly entangled. Fortunately I was able to cut the power very quickly. It was an awful experience, first being scared to death and then getting him untangled from the net. I wouldn't recommend this for goats. If I did something wrong I can't imagine what. I would return it but I can't seem to get it back into the box. This fencing is lightweight and easy to install. If you has an area that isn't heavy weeded and you are using it with animals that are used to hot wire, it's great. It will need a little extra support here and there to help keep it from drooping. The netting fence has worked very well for our sheep and calves. Bought several sections of this fence to use for temporary grazing for my does; been very happy with it so far. I was a little worried about sagging since posts are further apart than my other electronet products but I had no trouble getting the fence up tight and it stayed tight. I like the height of this product as well, it discourages goats from trying to lean over the fence and when they get shocked once they usually keep a distance. If this product doesn't work for you then it's probably user error.